"The 4th Parallel: Point of Origin" - Part 2A: "Right Hand Man"
Darrin Profitt, now calling himself the Red King, begins the first of his three attempts to defeat the Justice League. In this scenario he makes a dramatic appearance assisting the Justice League in a battle with the Royal Flush Gang. Over time he begins to win over the League both as the Red King and as Darrin Profitt. Despite supplying the Flush Gang with their tech the Red King finally defeats the group and Superman offers membership in the Justice League. Story - 4: Part 2A? Now that is kind of novel. We have a story that deals with a character exploring three different scenarios on how to defeat the Justice League and instead of having it be the usual Part 2, Part 3 and Part 4 there are apparently going to be three Part 2s, A, B and C. If there was ever any question that this story wasn't going to be fun I believe that the title to this issue is the answer. And it was a fun issue. Sure the Justice League members' dialogue was a bit two-dimensional, but then again this really isn't the Justice League's story. This is Darrin Profitt's story, so the characterization was directed towards him. It takes a little getting used to, but in the end it separates this story from the others that have been presented to us in this book. Darrin remains an interesting antagonist. In my review for the previous issue I mentioned that this story had a real Silver Age feel to it. That feeling carried over into this issue but, like last issue, it was done in such a way that I didn't mind it. Here Darrin tries to destroy the group from within by winning their trust and manipulating events to play the hero, kind of like Syndrome from THE INCREDIBLES, but with better hair. If you have ever read a good run of old school Legion of Super-Heroes stories than you should be familiar with this plot device. 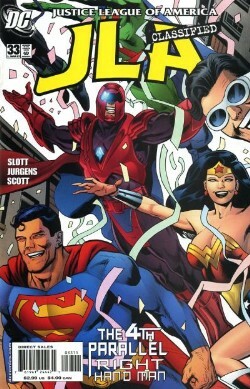 Slott and Jurgens go all out with it too with his trying to seduce the team, especially Wonder Woman. I really dug how the two writers had him not only playing hero as the Red King but also as Darrin Profitt, Philanthropist At Large. This story continues to be very entertaining and a solid read. Slott's plot (hey, a rhyme) and Jurgens' dialogue comes together nicely and there was a good bit of humor mixed into the blend as well, especially when it comes to Plastic Man, who is acting true to form. I look forward to reading about the remaining two Red Kings and their plans to (cue manic laughter) defeat the Justice League. Art - 4: More of that Jurgens goodness that I like so much. There is a sense of comfort in his art, something familiar that reminds me of some of the best times of my comic collecting life. Jurgens' talent is combining interesting page layouts that are full of storytelling with dramatic representations of the heroes. All of the heroes look good, even Plastic Man. Again, I don't know how tight his layouts are because his style shines through even with Trevor Scott's finishes. I always thought that Josef Rubenstein was Jurgens' best inker, but Scott does a solid job of it too. Cover Art - 4: This is certainly a happy cover, isn't it? Everyone looks so darn excited that it is almost infectious. It's also a solid cover. Nowlan and Jurgens' styles mesh well together, which can be a tricky thing when two artists have such different styles. I also liked how the Red King looked on this cover. To me his smile is not because he feels accepted but because he managed to pull the wool over the eyes of the Justice League. Once again the entire package of this issue (cover, art and story) come together to make a great comic book.